Well, it's time I organised the stash. It's been sitting in a corner for far too long. I've completed steps 1 and 2. When completed, the yarn will be organised and accessible instead of sitting in a giant mountain in the corner of my living room. 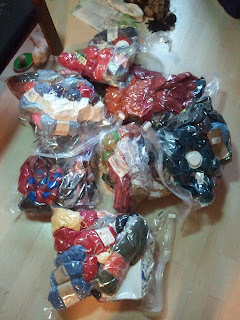 Step 2 was putting all this yarn into vacuum garment bags. I used 7 out of the 8 I bought. Here is a picture of my victory. The final steps will be hanging the cloth shelving I got from IKEA and putting the yarn in the shelving. If worse comes to worse, I'll get more little bags and split the current bags into more bags. In other news, I have a few quick projects on the go. A couple of my instructors at the gym are having babies and I'm a huge advocate for quick baby knits. More on those when I finish. WHEEEE! Tonight is knit night so I'll likely get a crapload of stuff done. Either that, or like at every knit night, I'll just end up ripping it all out. With me? Either is completely possible.